'Champagne Frost' (Keith Keppel, R. 1996). Seedling# 92-59C. TB, 35" (89 cm), Midseason bloom. Standards blue white (M&P 33-A-3) faintly flushed very pale pink (1-AB-7); style arms blue white, crests brushed buff peach; falls peach buff (10-CD-3) flushed peach (9-AB-3), hafts suffused corn (10-I-5); beards princeton orange (9-K-11), base and end white; ruffled; slight sweet fragrance. 'Lucky Lemon' X 'Overjoyed'. Keppel 1997. 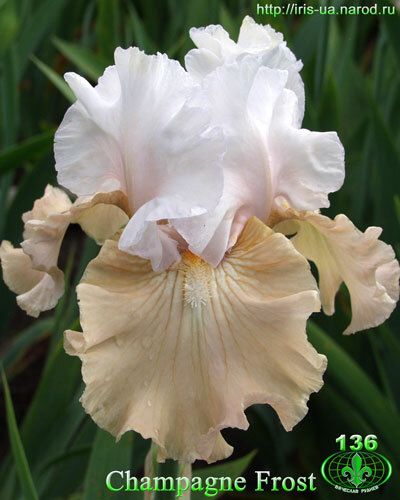 From AIS Bulletin #305 April 1997 Introducing CHAMPAGNE FROST (Keppel) TB, M 35" (Lucky Lemon X Overjoyed) Ruffled blue white and buff peach amoena. Best seedling, Portland 1996. EC 1996. #92·59C. $45.00. Keith Keppel. jpg IMG_9070-X2_champagne_frost.jpg manage 253 K 17 Feb 2016 - 06:05 BrockHeilman Please contact Brock Heilman for image use.